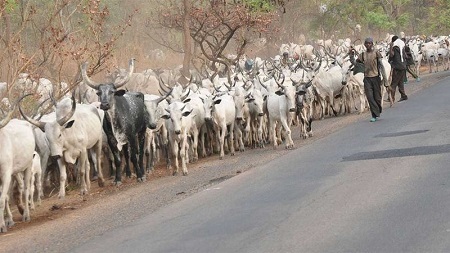 As many as eighteen passengers in a commercial bus escaped death by whiskers yesterday as about 200 cows ran across Owo-Benin expressway in Ondo State, leaving many of the passengers with injuries. It was gathered that the commercial bus, marked KPA 77LG, was coming from Lagos and heading to Owo when the incident happened. Vanguard reports that eyewitness said the crash occurred close to Uso town. According to the eyewitness, “despite efforts by the driver to avoid the cows, two of them hit the bus. A dead cow was seen at the scene of the accident. Some policemen rushed to the scene and cleared the expressway, while those injured were taken to the hospital.